I’ve been listening to songs by the Celtic Women lately. In particular, one song—Isle of Hope. It’s a song about Ellis Island and the immigrants of the late 19th and early 20th Centuries. By coincidence, my father at age two, his parents and his five other siblings immigrated to the US via Ellis Island. I’ve visited Ellis Island. My parents and I took a trip and one stop was at New York. Dad had a nephew living in Manhattan. While we were there, we also toured the city and took a trip out to Ellis Island. This was in 1959, if I remember correctly. The island was closed during WW2 and when we visited, most of the buildings were needing repair. One small building housed the National Park Service staff and all the records of immigrants since 1892 when the Island opened. I remember my father going through the records for November 1904. I don’t remember the exact date but he found the entries of his family arriving via a German ship via Hamburg. The Park Ranger said that each country, at that time, had a quota—not of individual citizens, but by point of departure. That year, November 1904, the UK and Ireland had filled their quotas. Germany had not. Therefore, my father and his family entered the country from Hamburg and were counted against the German quota. When Dad searched the records, he discoved his family was almost sent back to Hamburg. Once of his sisters was sick. The medical examiner placed her, and the entire family, in quarantine for two weeks—if my father’s family could pay the cost of their food and board during the quarantine. Since I’m here, they paid the costs were released at the end of the quarantine to enter the country. There is so much controversy about immigration now. The libs what open borders. more welfare recipients, more mouths dependent on government, i.e., democrat largess using taxpayer money. When my father and his family entered the country, there was no benefits—no welfare, no food-stamps, no government housing, nothing that they couldn’t pay for themselves. One of the requirements, at that time, was that all adult males must have a usable skill, a skill or trade that would allow them to become self-sufficient. My father’s family were miners, a skill in high demand. Specifically, my grandfather, and later my father, was a Master Blaster. He prepared and set off explosions in the mines to provide access to the mine’s coal or ores. How different are the days from then until now. My father’s parents and his family came to the United States to take advantage of the opportunities present here. My father followed my grandfather working in the mines as a Master Blaster. My two uncles became engineers. My aunts married and moved across the country from the glassworks of Pittsburgh, to the factories at Chicago and Indiana to the plains of eastern Colorado. The immigrants of today evade the entry requirements. They bypass the legal immigration path to sneak across the border in violation of our law. They commit crimes coming here illegally and continue to commit crimes by staying here. They don’t and won’t assimilate into our culture but by refusing to assimilate, wreck great harm to the United States. These illegals provide no benefit to our nation.Rather, they are parasites, leaching off our country and our taxpayer dollars. Most men my age, served during Vietnam in one form or another. After I graduated from Southern Illinois University, I entered the Air Force. Ken went into the Army. I was born and grew up in Illinois, southern Illinois in Benton, IL, the Franklin County seat. I attended Benton Consolidated High School along with several hundred others. One of those in my class was Kenneth W. Tate, a very distant cousin from my mother’s side. Ken was a tall, lanky, farm boy, who lived, if I recall correctly, to the northeast from Benton. I lived on another farm in the opposite direction. If it weren’t for the occasional family get-togethers and high school, I’d probably never have met him. But we were distantly related and we did attend high school together. We ran around with the same bunch and were geeks and band-members. I played a trombone, Ken played the drums. For him, like many of us, being in the band was more of an opportunity to get out of PE class that is was for music. The school felt that being in the marching band in the fall was sufficient to meet the state’s PE requirement. That drew many into our band clique. Ken and I took the same math and science classes. We were lab partners for Biology, Chemistry and Physics…the standard college-prep curriculum. When we graduated in 1964, I went off to Southern Illinois University. Ken started classes at a nearby Junior College but he didn’t attend long. The draft was in force during that time. It was a strong motivator to remain in school with a 2-S deferment. Rather than being drafted, Ken enlisted in the Army. I lost track of him until a couple of years later when I received a letter from my father. Inside with the letter was a clipping…Ken’s obituary. I didn’t know the details until later. A trip to Northern Illinois by a U.S. Army veteran resulted in an emotional tribute to a Benton man who died in the Vietnam War. Joe Hare of Columbia, Ky., on Tuesday honored the memory of fellow Black Lions 28th U.S. Infantry member Kenneth W. Tate, who was killed in action on Sept. 6, 1967 — two days after his 21st birthday. Hare and his wife, Pat, were joined by some of Tate’s family members and friends at his gravesite in the Masonic & Odd Fellows Cemetery. 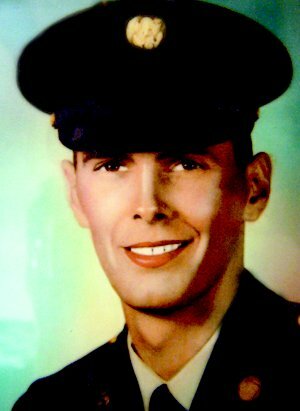 Tate was the first person from Franklin County to die in Vietnam. There’s a bit more information here at the Virtual Wall. I didn’t know Ken was a LRRP (Long Range Reconnaissance Patrol). All that we heard was that he was on a patrol and was killed. Someone, I don’t remember who now, said he was killed by a mine. I don’t know if that’s true or not. It doesn’t really matter, now. I don’t know why I keep thinking of Ken. We weren’t all that close. Circumstances put us together fifty years ago for a period of time. I can still remember his face. Perhaps it is, as someone once said, that as long as we remember, they aren’t really gone but live within us. I have no doubt Ken and I will meet again…and laugh remembering when we made nitroglycerin and bombed pigeons outside the window of our 2nd floor High School Chemistry lab using an eyedropper. The Court has been down for about a week. I’m not sure why. I noticed a week ago that when I tried to open the ‘Court, that nothing appeared. I was finally able to get an error message. One database table got corrupted and I followed the instructions on how to repair it. However, the ‘Court didn’t reappear after the fix. it’s taken me a week to figger out the cause. To repair the database, you have to add a line to the config file. I had failed to remove that line after the repair. A few minutes ago I did—AND IT’S BACK!!! I haven’t blogged in a while. but I did for eleven years. I would really hate to have lost it all. I originally wrote this post in 2012 after Sandy Hook. After the events yesterday at Marjory Stoneman Douglas High School in Parkland, Florida, it’s still as pertinent as it was six years ago. It was a school shooting, The difference was that this was at a high school instead of an elementary school. Similarities exist. A shooter walks into a No Gun Zone and kills. Contrary to the Connecticut shooting, there was a, one, law enforcement officer on campus—on the other side of the high school campus. Why is this important? The school contained 3,200 students, more than many of the small towns in the area, and with multiple buildings. Think on that for a moment. Over 3,000 kids, teachers, administrative staff and one, ONE!, protector. The libs scream for gun control. That has never worked and they know it. But gun control is all the libs have, nothing else. The current talking heads, including Florida’s ‘Pub governor call for more mental healthcare, and over-watch of those who have mental problems. That won’t work either. How can you know if someone, who has never drawn anyone’s attention, is homicidal? You can’t. Then what is the solution? One that has been proposed for years and the libs block at every instance. Arm the teachers, arm the administrators, and, hire some guards who have proven themself in critical situations—like veterans and retired or former police officers. A single security guard for a campus larger than many small towns across American is a sure path to failure, as we have just seen. The events in Connecticut triggered a memory. A memory from nearly 60 years ago at a time when I was in grade school. The school I attended was rural…a country school of three classrooms with a peak enrollment around seventy students. There were three classrooms, first through third grade, fourth and fifth grades, and in the largest room, sixth through eighth grades. There were three teachers—Mrs. Williams, Mrs. Rhodes, and Mr. Helfritch the Principal; one full-time janitor/school bus driver and two older ladies as cooks. The school was rich. It sat in the middle of a half-section of land; property deeded to the school district after WW1. The property also contained two oil wells whose royalties made the school one of the best funded in the county. This incident occurred early in the fall of the school year. A family rented an old dilapidated house about 300 yards from the school connected by an overgrown track reduced to a foot-path. That family had three children in our school; one boy my age, a younger sister and a younger brother. On this day, the older boy had done something, or perhaps, not done something to cause the ire of his father. We were at morning recess when we saw the father enter the front of the school, followed shortly by loud voices and words we weren’t suppose to know, much less speak. The father was quickly escorted out of the school by Mr. Helfritch. I don’t remember his first name. I may not have known it. All our teachers had similar first names—Mister, Miss, or Misses. I remember Mr. Helfritch as a slight, blond-haired man of medium height with a flat-top haircut. He was a WW2 veteran and a state policeman before being recalled for the Korean war. Lunch recess was the longest of the day; an hour at least. I suppose it gave the adults time to savor lunch, coffee and to talk a bit. On this day, Mr. Helfritch was, uncharacteristically, outside watching the kids. Some friends and I were playing marbles in an bare area we’d hacked from a small grove of man-high saplings and briers. It was “our” place. We hadn’t been there long when we saw the father returning accompanied by two of his brothers. They walked up to Mr. Helfritch demanding the older boy. My friends and I were close enough to hear some words, enough to understand some of the conversation. When Mr. Helfritch refused, one brother took a swing. In an instant, two of the three visitors were on the ground. The remaining one had a knife in his hand and Mr. Helfritch had a .45 pointed at the knife-wielder’s nose at a distance of about two feet. He carried the pistol in a shoulder holster every day my Father later told me. Someone called the Sheriff and Mr. Helfritch kept the three covered while Rudi, the Janitor, looped a few turns of rope around their legs. They were going nowhere quickly. A Deputy arrived some time later and hauled them off. My Father, who was an auxiliary Sheriff’s Deputy, told that Mr. Helfritch was a reserve police officer. He had been a full-time state trooper before being recalled for the Korean War. When he came home from Korea, he decided to be a teacher instead of a state trooper, but, like many in those times, he kept his reserve police commission. It was the only way he could legally carry a concealed weapon in Illinois. It was the same reason my father was an auxiliary Deputy Sheriff. I’d forgotten that incident for many years. Dad told me Mr. Helfritch said the school kids were under his protection. He would allow no one to threaten his students. I have no doubt, and it was proven in Connecticut last week, teacher’s today would do the same…if they had the tools to do so. Unfortunately, as was proven last week, those tools have been denied and those teachers did their best—dying defending their students. It should not have happened. The best defense for our children is still people—armed people—armed teachers willing to do what is necessary to protect their charges. I can remember celebrating Armistice Day. My earliest memory was standing along one of our town’s main streets with my family watching a parade of returning Korean War Veterans marching down main street accompanied by Tanks, bands and floats (tractor hauled wagons.) That changed by a proclamation by Dwight D. Eisenhower on October 8th, 1954 that designated November 11th as Veteran’s Day. Under this law, Veteran’s Day was observed on October 25th causing much confusion. President Gerald Ford moved Veteran’s Day back to November 11 by an order in 1975. Considering all the wrangling over the holiday, one result of having Veteran’s Day on November 11th is that no one remembers that it was originally set aside to celebrate the end of the First World War. Before the two holiday were merged, each had their own observances. Veterans are also honored on other days such as Memorial Day, Flag Day and and even the Fourth of July. I would much prefer that Veterans have a holiday all our own. A day solely for us and not usurping a celebration intended for others. Until that happens, however…Happy Veterans AND Armistice Day! The Marine Corps was created on November 10, 1775, in Tun Tavern, Philadelphia, Pennsylvania, by a resolution of the Continental Congress. 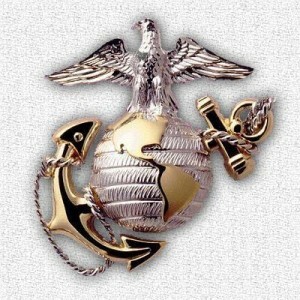 In 1834 the marines became part of the Department of the Navy. The globe and anchor signify worldwide service and sea traditions. The spread eagle represents the nation itself. The motto, Semper Fidelis, or Always Faithful, is clenched in the beak of the bird. His lord said unto him, Well done, thou good and faithful servant: thou hast been faithful over a few things, I will make thee ruler over many things: enter thou into the joy of thy lord. My wife and I was at dinner recently and we were discussing some long-ago event. It occurred to me that there was a single point that changed the direction of our life. A point that created a fork in our life, a divergence from the life before us. That pivot point was an invitation to lunch. It happened in January, 1976. I was working in an administrative job for a flour milling company. The company owned a number of flour mills across the country and one charcoal plant. My job, depending on the day of the week, was Payroll Manger (hourly employees), Data Processing Manager, Assistant Treasurer, Payroll Accounting Manger, and on Friday, Manager of the company Benefit Program—paying medical claims for the salaried employees. A couple of weeks after New Years in January, 1976, I received an invitation to lunch by a Ham Radio friend. I had been a Ham Radio operator for four years and was interested in RTTY, Radio Teletype. So was my friend. I had spent my Christmas Holiday building a RTTY demodulator. The device decoded two RTTY tones received over the air and converted the tones to Baudot code for the TTY printer. In transmit mode, it received Baudot code from my TTY keyboard and converted that code into two tones that would be transmitted over the air. I had designed and built the demodulator from scratch. I was very proud of it and, at the request of my Ham Radio friend, took it with me. My Ham buddy wanted to see it. When I arrived, I found my friend sitting with another. My friend was a field maintenance engineer for a Texas-based distributed computing company. The other person sitting at lunch was his boss. The boss was based in Minneapolis and visited Kansas City monthly. That day was his January monthly visit. The lunch went well. I presented my pride-and-joy, described the circuitry and the techniques I had used in its construction. After twenty minutes, my friend received a customer call, some equipment needed maintenance. He departed leaving me with his boss. It was a job interview. My friend had accepted a position within the company to be an instructor in the company school in San Antonio, TX. However, as part of the deal, he couldn’t leave Kansas City until he found a replacement. Me. I impressed my interviewer. I lacked knowledge of digital computing but I did have more knowledge of basic electronics than many of the current field engineers of the company. By the end of lunch, I had a job offer, for the Kansas City area, at twice my salary of my job at the milling company. I took it! My wife was five months pregnant and my salary of $600/mth was small compared with the cost of a growing family. I had been coasting since leaving the Air Force. My job at the milling company was dead-end. It was a family owned business and all the higher positions were limited to family members or very close family friends. The new job had more opportunities and the potential for a much larger salary. That pivot point changed our life. I became a field engineer. A few years later, I was second level support covering a four state territory. Not long after that, I was third level support for a seven state area and a regular visiting instructor in the company school teaching disk-drive maintenance, software design and programming and telecommunications. I have no idea what our life would have been if I hadn’t accepted that invitation to lunch. I’ve lost touch with my Ham Radio friend. A decade later the computer company was bought by a financier who broke up company and sold the pieces. That field engineering job eventually lead to position with Sprint that lasted until I retired as a Principle Network Design Engineer. While working at Sprint I was a programmer, manager, systems design enginer and finally a project manager. I acquired seven patents along the way. All in all, it’s been a good life. I wonder if I will meet Mike Rathbun again. I think I will.